This Action Kit provides introductory advice to assist school leaders, faculty, and parents on effective ways to prevent, respond to, and lead ongoing action to address bullying, hate, and bias incidents. More than one out of five students report being bullied. Students at Olympia High School in Olympia, WA. The first step in addressing any problem is to identify it, yet in the case of bullying, there are at least ten different definitions included in various state legislatures. But educators, school administrators and others in the trenches don’t have time to wait for a uniform definition; entire schools and communities need to understand and identify both bullying and intolerance and take effective action to prevent and respond to it. Bullying is an act of verbal or physical aggression with an imbalance of power between perpetrator and targeted student that is repeated, or has the potential to be repeated, again and again. Many schools use this operational definition from Dan Olweus, a researcher who has been working on the phenomenon of bullying for 40 years. An imbalance of power may allude to physical strength, access to embarrassing information, or popularity that is used to try to control or harm others. However, power imbalances can change over time and in different situations, even if the imbalances involve the same people. Upstander: A person who speaks up and stands up for themselves or others to stop harm from taking place and to support people targeted for hate. Inclusive and Identity Safe Schools: Schools where people of all backgrounds feel safe, respected, and valued. Hate Crime: A criminal act that is motivated by hate or bias on the basis of race, color, national origin, gender, gender identity, sexual orientation, religion, or disability. Hate or Bias Incident: A bias-based act of bullying, harassment, or intimidation that is against the school discipline policy, but does not rise to the level of a crime. Students in Lancaster, CA write on a blackboard to show their support for inclusivity at their school. Bullying can lead to serious problems affecting emotional well-being, social interactions and development, and academic focus and performance. Some incidents affect the entire school and can spread nationally via the press and social media. Relational bullying is manifested through exclusion, spreading of rumors and social isolation. Relational bullying is manifested through exclusion, spreading of rumors and social isolation. It often occurs among students who are trying to raise their social status by rejecting someone from their group. This form of bullying can be more subtle and is also much harder to address, both from a response and research perspective. Yet it can be just as devastating, and often goes unaddressed over years, resulting in damage across a lifetime. "Bullying can account for a decrease of 1.5 grade levels in one academic subject over three years." Seventh graders at Orinda Intermediate School meet Shajee Syed-Quadri, president of the Muslim Student Association at Irvington High School, following his presentation about what it's like to be a practicing Muslim student. Bullying, threats, racial slurs, and violence deeply affect students. Hate incidents harm not only the persons targeted, but their classmates, schools, and communities. Students can be targeted for their race, gender, sexual orientation, socio-economic status, perceived sexual orientation, religion, appearance, and disability. Along with bullying, intolerance is often at the heart of victimization. Intolerance is often revealed through unkind remarks with stereotypical comments regarding a person’s identity, such as their race, ethnicity, language, sexual orientation, religion, or physical ability. These intolerant attitudes can be developed and/or supported via the attitudes, actions and behaviors—sometimes conscious and sometimes not—of peers, family, teachers, coaches, or other individuals in a child’s life, but also through the media, music and the Internet. Students may express intolerance toward others overtly in a classroom or public setting, but this also often occurs in venues where adults are not even aware it is taking place. Intolerance is often embedded in institutional practices. Some examples of systemic intolerance and institutionalized racism include the disproportionate number of African American or Latino students who are suspended and expelled or when the academic proficiency standards for certain ethnic groups are lower than others, as is true in Florida and Virginia. That tacit acceptance of racially biased systemic initiatives creates a climate for interpersonal intolerance of all types to flourish. Intolerance and bias-based bullying have been increasing in K-12 schools with life-long negative impacts. A Not In Our School anti-bullying campaign at Del Sur Middle School in Lancaster, CA. The all-too-common practice of holding a moving schoolwide assembly or community event about the devastating impact of bullying is not enough to prevent bullying, nor will things change by simply explaining or posting the rules, laws, and policies. Change comes through ongoing, consistent focus on creating a welcoming, inclusive environment and interactive, educational opportunities for students to learn how to appropriately interact with their peers and address issues they are dealing with. Make expectations clear through regular messages by administration and teachers to inform the students that this is a safe and inclusive community, and that bullying, hurtful teasing, and intolerance are not acceptable. Inform the parent community as well. Ensure the entire school community knows the definition and serious consequences of bullying and ways to report and take action. Make values visible through events and school-wide campaigns. Develop a shared language for the school community. Supervise hallways and monitor routes to and from school to make sure your school is physically/emotionally safe. Share with students the various staff members they can and should approach to discuss issues of bullying. These should include their classroom teachers, but also others in case — for whatever reason — students do not feel comfortable reaching out to them. Consider guidance counselors, specials teachers (e.g., physical education, art, computers), principals and assistant principals, and teachers in other grades that students may feel a connection with. Help students learn to find their voice. Teach them to be upstanders who stop harm by standing up and speaking up for themselves and others. Practice refusal skills, so students feel more comfortable standing up to peer pressure. Create classroom lessons that help students learn social and emotional skills, empathy, respect and ways to stand up to bullying and intolerance. Provide professional development for the entire staff on bullying prevention, culturally responsive teaching, and how to support students of all backgrounds. Train staff to respond to and prevent bullying, and make sure they understand rules, policies, and reporting protocols. Protect and support staff with information about the policies and reporting protocols for bullying and harassment. It is critical that teachers, administrators, counselors, and all school staff clearly understand rules and reporting protocols addressing bullying, harassment, and hate incidents. A teacher at Orange High School in Pepper Pike, OH assists students in mapping out areas where bullying occurs in their school. Teachers and administrators are on the front lines in addressing bullying and intolerance. When leaders are brave, others will follow. Leadership can be initiated by any member of a school community, regardless of role. Ignoring the problem of hate and intolerance may lead to escalating violence and mistrust. Get the targeted student(s) to safety. Assure school safety, following emergency protocols and discipline policies. Involve law enforcement for hate crimes. Work with your district’s legal department. Meet separately with involved parties and families. 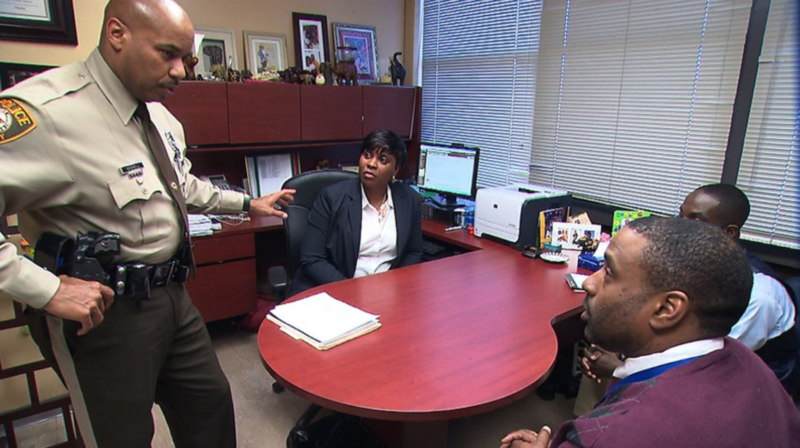 Listen to, encourage, and provide counseling for any of the parties if needed. Monitor to ensure safety and that bullying ceased. Teach students to stand up for themselves. Label the behavior (not the students). Initiate consequences and help students who bully others transform behavior. Provide social skills training and counseling to help perpetrators transform their behavior. Use restorative practices with opportunities for students to repair harm. Work closely with their parents. Do not humiliate or submit them to public shaming. Hold involved bystanders accountable and give them skills to be upstanders. Make it a learning opportunity about difference if the incident involved targeting someone for being different (whether it is gender expression or identity, race, sexual orientation, religion, appearance, ability, etc.). School Resource Officer Ron Cockrell meets with Principal Chaketa Riddle and teachers at Central Middle School in Riverview Gardens near Ferguson, MO. Acknowledge hate speech, hate crimes, or bias incidents when they occur and make it clear to students and the broader community that this type of behavior is unacceptable. In all cases, the incidents should not be brushed under the rug. A planned response by school leaders is needed. Be transparent, provide information and denounce the incident, indicating a full investigation is in process. Meet with staff, providing necessary information and a shared message with talking points. Send a letter to the community explaining/denouncing the incident. Indicate a full investigation and response is in process and share the commitment to ongoing efforts to ensure this does not occur again. Develop a press release with the district PR department. Prepare talking points for the media, being careful not to break legal requirements for privacy of minors. Dispel rumors and misinformation and provide updates. Support all students and keep them safe. Assure safety of the target(s) and others who share the target’s background. Make counselors available for any student who needs assistance. Hold a carefully facilitated town hall meeting to share efforts and listen to concerns. Include local community organizations that represent diverse communities. Develop a plan with ongoing activities and lessons to unify the student body. Make a sustained commitment toward healing. "Kids who are identified as bullies by age eight are six times more likely than non-bullies to be convicted of a crime by age 24 and five times more likely than non-bullies to end up with serious criminal records by age 30." At Orange High School in Pepper Pike, Ohio, students mapped their school to locate the spaces where bullying takes place. Each of us has a role to play in creating safe, inclusive communities and schools for everyone and stopping hate, bullying, and intolerance. It is especially powerful to put students in the driver’s seat to identify solutions and motivate their peers to become empathetic upstanders. Start a leadership group to organize activities. If possible, carefully, strategically include those who have been involved in bullying. 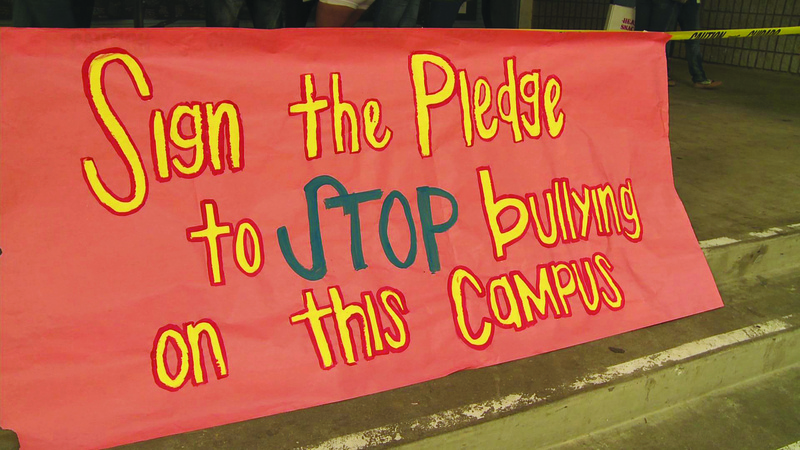 Create a school and/or community pledge to stop bullying, name-calling, and intolerance. Prepare a presentation or video to teach other students about bullying and how to be an upstander. Hold a “flash mob” on campus, with the approval and possibly even participation of teachers and staff, during lunch break or other free time to raise awareness about bullying. Develop a cross-learning service project where older students help younger students complete an activity. Map the places where bullying happens in the school. Document activities: take photos, film interviews, and write articles. Inspire students of all ages to develop and share innovative ways to resist bullying and promote an atmosphere of acceptance and inclusion. A Not In Our School campaign (NIOS) is an ongoing commitment to empower students to create safe and inclusive environments that are free of bullying, anti-gay harassment, bigotry, racism, and all forms of intolerance. Every NIOS campaign takes on the characteristics of the school community and responds to local issues and needs. Students are supported in defining the problems and solutions and work to incorporate peer-to-peer actions, help bystanders gather the courage to be upstanders, and make their schools safe. Find step-by-step instructions for launching a campaign in the Not In Our School Quick Start Guide. 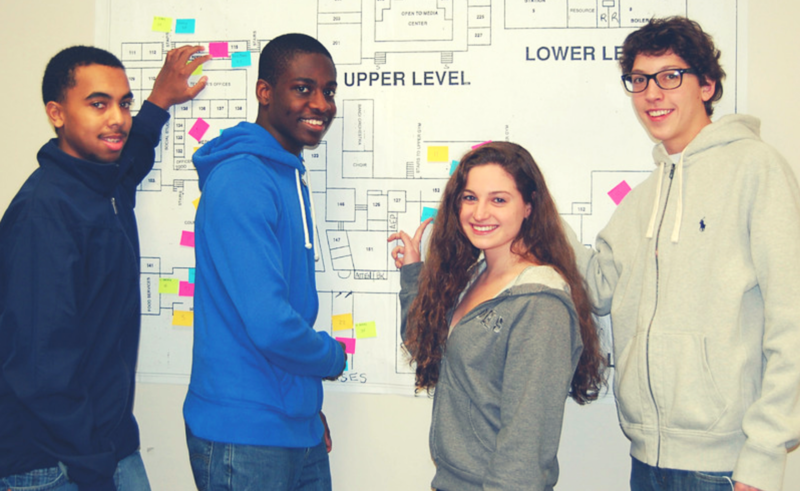 Action: At Orange High School, students mapped their school to locate the spaces where bullying takes place. After identifying the "bully hotspots," including the cafeteria, media lab, and locker rooms, they created a flash freeze demonstration to raise awareness about bullying and opened the conversation about how to create a safer school. Read the full story. Action: Students at Norwood Junior High School sent paper cranes as a symbol of peace and healing to the community of Oak Creek, WI after a deadly hate attack at The Sikh Temple. In this video, they share why the project was so important to them, including personal experiences of being the target of bullying and intolerance. Read the full story. Action: Students at Watchung Hills Regional High School led a community-wide "White-Out to Erase Bullying" campaign. High school leaders tied white ribbons on trees and students pledged not to be silent in the face of bullying at their high schools, middle schools, and elementary schools. Even the mayor and city council members joined the effort! Read the full story. Action: After a series of anti-immigrant attacks by local teenagers ended with the hate crime killing of local immigrant Marcelo Lucero, art students at Patchogue-Medford High School wanted to do something positive for the Lucero family and spread a message of peace. Over the course of a year, students gathered after school to create We Are All United: No One Walks Alone, a mosaic dedicated to Marcelo Lucero. Read the full story. Develop lessons, create school-wide campaigns, and inspire students to be upstanders. On the edge of the Mojave Desert in California, educators, political leaders, and students join in a citywide Not In Our Town campaign. After teen suicides devastate two nearby towns, a middle school counselor initiates a youth-led anti-bullying program for several districts with over 35,000 students. This film features high school students mentoring younger students. A lesson plan is available. (9 minutes; Middle and High School) Read the full story. The students of Newcomers High School in Long Island City, NY, which specializes in teaching recent immigrants, and those of St. Luke's, a private middle school in Manhattan, come together to dialogue about difference and combat bias. The Building Bridges project was created through a collaboration between Newcomers teacher Julie Mann, and St. Luke's teacher Kim Allen, who met ten years ago through a Facing History workshop. Ms. Mann's class of English-learners exchange letters with their St. Luke's "buddies," and in the first of several meet-ups, receive help editing their personal immigration stories. In return, St. Luke's students prepare research papers on immigration informed by the interviews they conduct with their Newcomers buddies. A lesson idea is available for this film. (8 minutes; Middle and High School) Read the full story. At Orange High School in Pepper Pike, Ohio, students are mapping their school to locate the spaces where bullying takes place. After identifying the "bully hotspots," including the cafeteria, media lab, and locker rooms, students created a flash freeze demonstration to raise awareness about bullying and opened the conversation about how to create a safer school. A lesson idea for this film is available in English and Spanish. (3 minutes; Middle and High School) Read the full story. At Grimmer Elementary School in Fremont, CA, sixth graders work with their first grade buddies on a fun activity about speaking up and being an upstander. After intermediate students share personal experiences about the impact of bullying, they paint footprints with positive messages "walking" though their campus. Later, they make paper footprint cut-outs with first graders and post upstander messages around the school. (6 minutes; Elementary and Middle School) Read the full story. In the heart of the South, students at the University of Mississippi question whether traditions tied to the Confederacy and segregation still belong on their campus. When a chant and football fight song surface old racial tensions and divide the Ole Miss community, student leaders, supported by their chancellor, bring people together. (11 minutes; Middle and High School) Read the full story. What Do You Say to "That's So Gay"? Video of What Do You Say to &quot;That&#039;s So Gay&quot;? In a lively class discussion, Gunn High School students in Palo Alto, CA challenge the saying "That's so gay." Watching this film can inspire viewers to speak up next time they hear this common phrase. An activity guide is available to help guide classroom discussion. (5 minutes; Middle and High School) Read the full story. Students at Watchung Hills Regional High School in New Jersey create a community-wide anti-bullying campaign. During the "White-Out to Erase Bullying" event, high school leaders tied white ribbons on trees and students led activities pledging not to be silent in the face of bullying at their high schools, middle schools, and elementary schools. Even the mayor and city council members joined the effort. A lesson plan is available for this film, as well as a guide for starting your own anti-bullying White-Out campaign. (5 minutes; Middle and High School) Read the full story. After transgender teen Gwen Araujo is killed by local youth in the Silicon Valley suburb of Newark, California, the town's residents and civic leaders must acknowledge and deal with this brutal crime. Through their local high school production of The Laramie Project, students and residents begin to see parallels in their own community. (6 minutes; Middle and High School) Read the full story. Find more than 30 short films that showcase the incredible energy and enthusiasm of young people. In these NIOT originals and other films, students demonstrate creative ways to take a stand against bullying, anti-gay bigotry, and all forms of hate. Watch and share! (Middle and High School) Read the full story. Featuring 18 films, lessons, posters, personal stories from educators and students and much more, the kit contains everything you need to launch your own Not in Our School anti-bullying campaign and incorporate social-emotional learning and identity-safe practices throughout your school. Provides a step-by-step process for launching a Not In Our School campaign. Also available in Spanish. Not In Our School’s comprehensive school climate improvement program includes tools to assess climate and create a whole school change, including staff and parent education and ways to get the whole community involved. Extensive educational resources paired with the award-winning film BULLY help educators ignite honest, meaningful dialogue that focuses on developing empathy and taking action. Provides free educational materials and programming for teachers and other school practitioners dedicated to reducing prejudice, improving intergroup relations, and supporting equitable schools. Tips on how to create a diverse, multicultural, and inclusive class environment. From Facing History and Ourselves, resources examining division and intolerance, as well as powerful cases of individuals and communities working together and standing up to hate. Western State Center's toolkit shares strategies to counter white nationalist organizing through sample scenarios that schools frequently encounter. Hosted by the Center for the Collaborative Classroom, explores strategies for creating “identity safe” classrooms in which teachers strive to ensure that students feel that their social identity is an asset rather than a barrier to success. Lesson plan from Islamic Networks Group looks at core values shared by five of the world’s major religions: Hinduism, Buddhism, Judaism, Christianity, and Islam. Brief guide by Gender Spectrum outlines best practices for creating gender inclusive schools and classrooms that welcome all children and teens. Lesson plans by Anti-Defamation League help educators guide classroom activities addressing identity-based bullying, cyberbullying, and other topics. Common Sense Media’s curriculum to help empower students to make safe, smart, and ethical decisions online. Resources to help increase parental engagement in education and ensure that parents become successful advocates for their children, with the goal of improving K-12 student performance, retention, and access to equal educational opportunities. As hate group activities and hate and bias incidents rise, concerned community, campus, school, civic, faith and law enforcement leaders and activists actions are needed more than ever. These guides provide effective steps that can help communities face hate and bigotry, and work toward a more inclusive future. We can STOP HATE, TOGETHER. The Lawyers' Committee for Civil Rights Under Law seeks to secure equal justice for all through the rule of law, targeting in particular the inequities confronting African Americans and other racial and ethnic minorities. The Lawyers’ Committee for Civil Rights Under Law launched the Stop Hate Project to strengthen the capacity of community leaders, law enforcement, and organizations around the country to combat hate by connecting these groups with established legal and social services resources and creating new resources in response to identified needs. Not in Our Town is a movement to stop hate, address bullying, and build safe, inclusive communities for all. Not In Our Town films, new media, and organizing tools help local leaders build vibrant, diverse cities and towns, where everyone can participate. Find specific resources for communities, schools and law enforcement on NIOT.org.